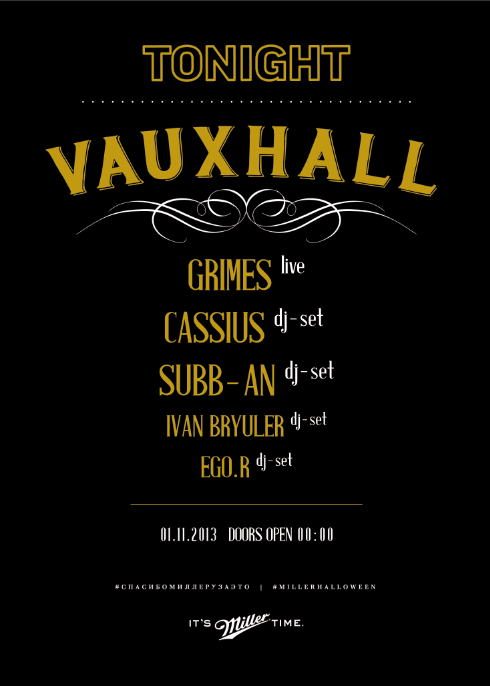 Subb-An, Cassius and Grimes are confirmed to play at Tonight Vauxhall this Friday night in Moscow. The conceptual event, run by Miller to celebrate Halloween, is set to be a visual spectacular themed around the concept of travel - and is based in one of Moscow’s most famous train stations. Previous instalments have seen the Miller crew take over unusual spaces in the Russian capital to create memorable parties featuring Hot Chip, Jamie Jones, Lee Foss and Justice. This year's headliner - avant-garde Canadian musician Grimes - will bring her melodic, surreal and uplifting electronic vibe to Moscow for this one-off event. DJ talent comes courtesy of Crosstown Rebels artist and former Best of British Best DJ winner Subb-An, plus French house duo Cassius. As always, this event is strictly invite only. However we have two tickets to give away to one of our lucky Russian readers. To be in with a chance of winning, simply email competition@djmag.com telling us why you deserve the tickets. (The prize is tickets only - so you will need to make your own travel arrangements). If you are not in Moscow, or don't win the tickets you can still keep abreast of the action by following the #MillerHalloween hashtag on Twitter and our own live updates from the event.